The automotive world needs to freeze. Right now. Stay just where it is. Well, the noisy performance car part of the industry, at least. I’ve long wondered when exactly fast cars ‘peaked’; to pin down the point at which these machines were at their most engaging and at their most exciting. I don’t - like a lot of people - think it was the 1980s. But the mid-to-late-ish 2000s? That’d what I’d - wrongly - had in mind up until now. This was the time in which BMW decided its M3 needed a V8, and its M5 a 5.0-litre V10. The time when hypercars like the Porsche Carrera GT and Ferrari Enzo made their power the old fashioned way, without any hybrid shenanigans at play. It’s not so long ago that the cars had floppy chassis and slow steering, but long enough to be before the scourge of downsizing took hold. I’ve been wrong all this time though: the golden age is now. 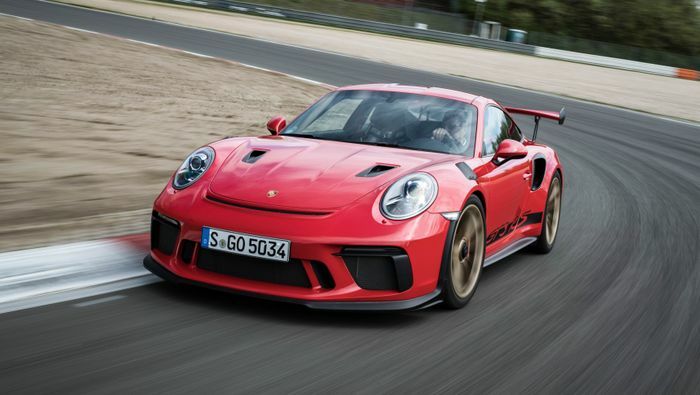 The perfect marriage of a big, atmospheric engine and a sublime chassis has just arrived, and it’s the 2019 Porsche 911 GT3 RS, which I’ve just driven on the Nurburgring GP circuit. 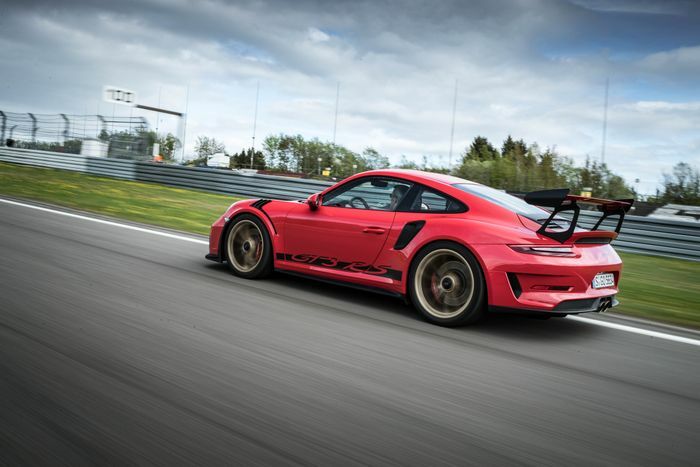 Of course, the old one was already sensational and hard to pick fault with, but Porsche has comprehensively tweaked the car to produce an even better version we don’t really need, but we’re damn well grateful for. On the bodywork front we have revised front and rear bumpers, ‘Naca’ air ducts on the bonnet that cool the brakes while increasing downforce without adding drag (how’s that for engineering witchcraft? ), and new three-dimensional wing endplates. The latter change is for “optimised airflow” apparently, although the curved parts have the added benefit of making the car look extra badass when viewed directly from the front or rear. The spring rates have been increased (more so at the front), and the suspension arms now have uniball bearings to tighten things up further. 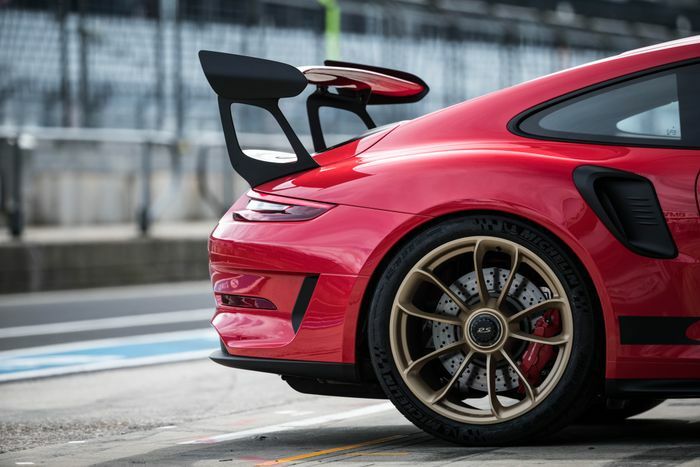 The biggest single change, though, is found in the engine bay: here you’ll find that fancy new motorsport-derived 4.0-litre flat-six first seen in the 991.2 GT3. 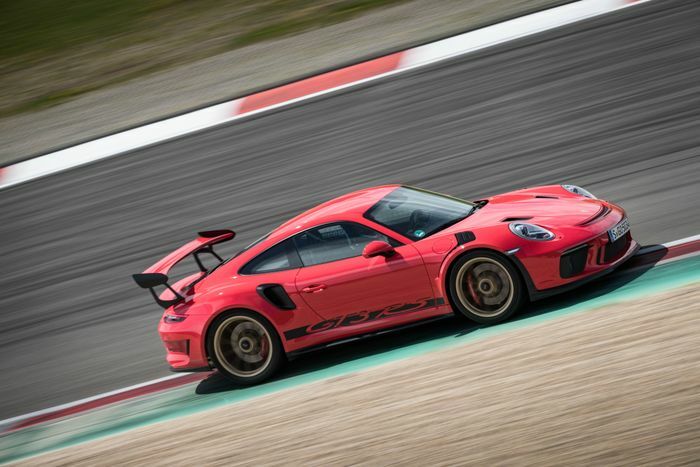 Let’s start our 2019 GT3 RS examination there, shall we? With big, powerful N/A engines becoming an endangered species, we often find ourselves pining for powerplants with ‘character’. But here’s the thing: this 4.0-litre atmospheric flat-six - good for 513bhp - has a character that changes depending on how much you rev it. It’s like several engines in one, and each one is awesome in its own way. It has that classic Porsche clatter at very low revs. It lets out a savage howl in the mid-range. Then from about 6500rpm and up, it actually screams at you. But just when you think the RS is done making sweet, sweet noises that’ll stick with you until the day you die, you hit the 8000rpm mark and the flat-six says ‘but wait - there’s more!’ and lets out an ungodly shriek. This is the Billy Mays of the engine world. It’s wickedly responsive, wonderfully linear and ever-so-slightly more dramatic at the very top end than the one in the last GT3 RS. For aural drama, it has Audi’s 5.2-litre V10 well and truly vanquished. “Ever so slightly” is the key phrase to associate with the new RS. 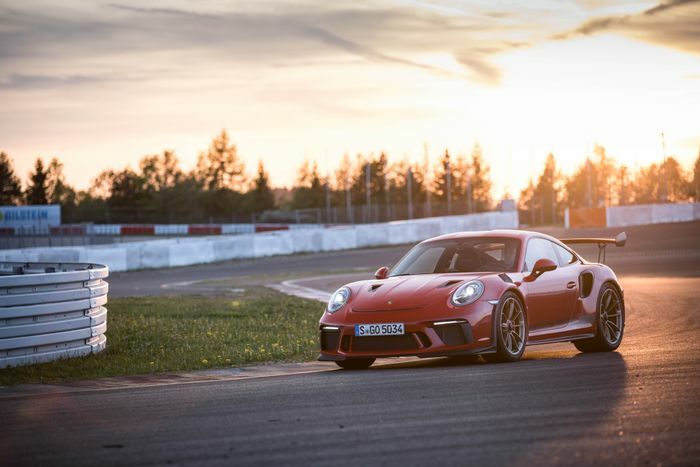 Porsche has merely tweaked, honed and perfected to turn an already incredible driving machine into a more compelling package than ever. The steering remains a highlight - no other car has electric power steering quite as well sorted as this. It’s not just the weight and the speed; it’s also the genuine feedback that’s delivered to your fingertips. The trade-off is back home on rubbish surfaces it’ll probably produce some hyper-aggressive kickback just as the old one does, but that’s half the fun. That sense of rightness can be experienced with all of the driving controls, from the pedal feel to the amount of pressure you have to squeeze the up and downshift paddles with to swap a cog. It’s all spot on. And the PDK automatic gearbox is - by the way - still a lesson in brutal efficiency. Having been frustrated with the ZF-sourced ‘box in the Aston Martin Vantage the other week and its unwillingness to downshift exactly when you ask it to on track, this is a breath of fresh air. Rain hitting the Nurburgring GP circuit on our third lap screwed up the chance to truly push the GT3 RS, but even so, it felt mighty. Particularly in the higher speed corners, where an unflappable feeling of stability sees you take a mental note to go through that fast right-hander just a bit quicker next time around. The initial turn-in is deliciously sharp, too. There is, of course, the rather conspicuous quirk of having a flipping great engine at the aft end of the car, which helps the traction (something the RS predictably has vast reserves of), but necessitates a little trail-braking into some corners to make sure there’s enough weight on the front axle. If you don’t, understeer can rear its head, and quite dramatically so in the wet. It’s just another factor - along with traits like the aggressive steering - that make this a car that won’t suffer fools. You have to really think about how you’re driving it to extract the most from it. Is the difference between this and the outgoing car truly noticeable? 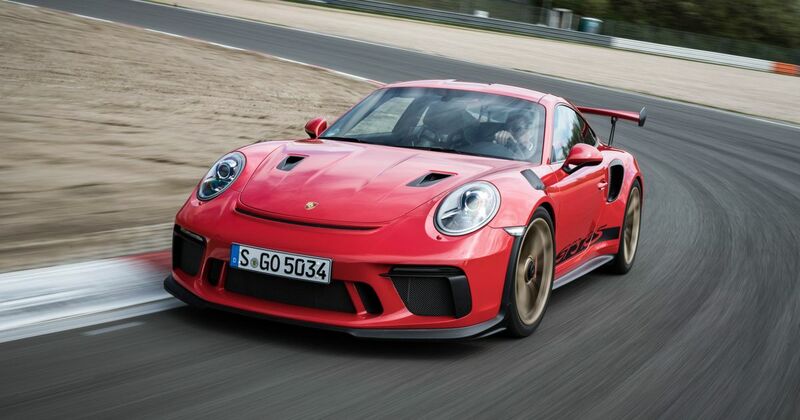 I think you’d have to drive the 991 and 991.2 back-to-back in the same place to truly suss out the nuances of what Porsche has done to the chassis and the aero. Comparing one wet and slippery track drive to a road drive nearly two years ago makes things a little more difficult. But judging this car alone, we’re happy to label it a masterpiece. You’re not shocked, are you?